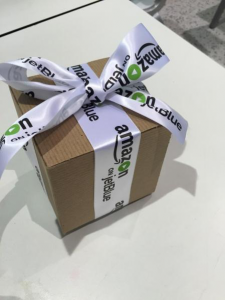 Uncategorized Archives - ThirtySevenWest ThirtySevenWest - Creative ideas about personalized custom ribbons, woven tags and labels, personalized gifts and more!!! 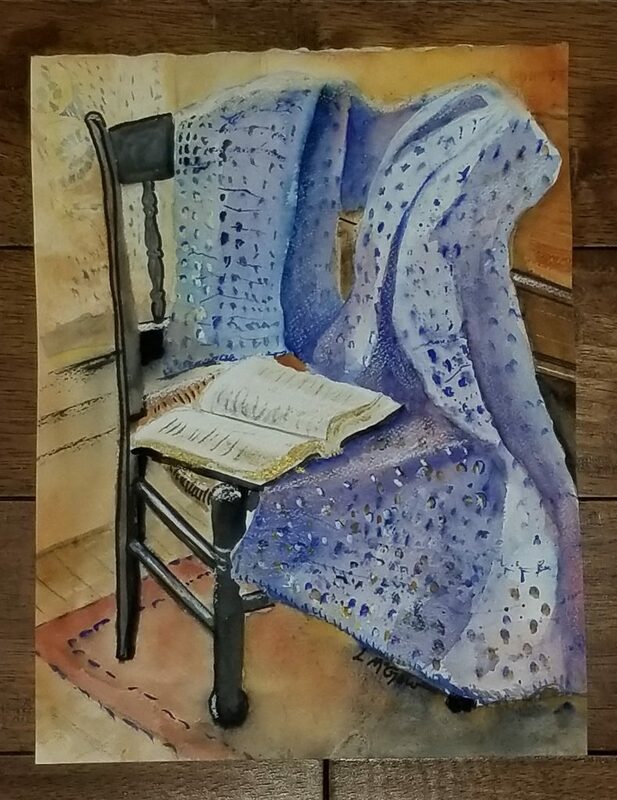 Our Prayer Shawl Ministry started many years ago, A former UMW member who is now deceased, painted a lovely water color picture of a blanket draped over a chair, with an open bible in the seat of that chair. Our group used that original painting as an inspiration for the design that we ultimately had Thirty Seven West use on a custom embroidered label design. Our members crotchet shawls, lap blankets and small squares or circles. We also craft blankets that are quilted, or make blankets that are felt that we tie strips around the edges. We hand sew the labels onto an edge of each shawl and blanket. They are brought to our meetings and we stand in a circle holding on to a piece of each item, and we pray over them that they will bring comfort and joy to the receiver. They are given in instances of a hospitalization, a prolonged illness, a death of a family member, a new baby, a graduation, or a new step in life – such as moving to a nursing home. In each instance, we have a card with a prayer that is appropriate that is given with the item. We are a small group, but we have six or eight members who actually make these things. 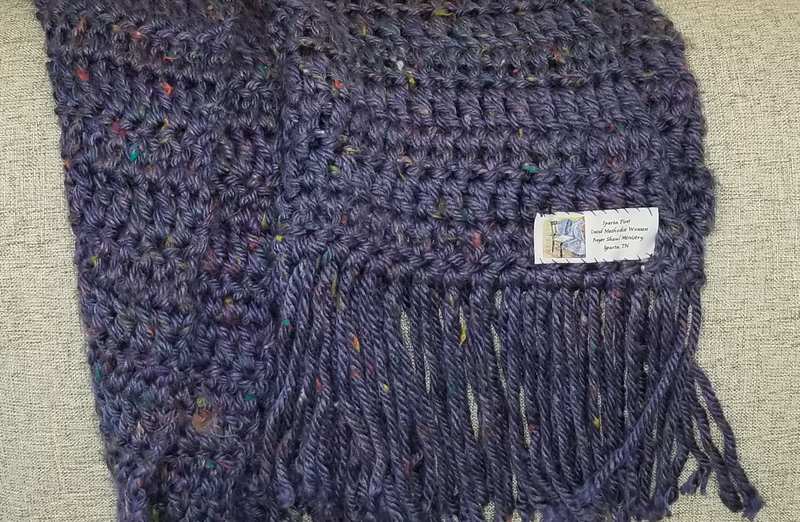 The ministry is open to our whole congregation to have access to the Prayer Shawls and Prayer Blankets to give not only to folks who are members of our church, but to anyone they feel is needing this kind of support. Each year we give thirty to forty blankets and shawls for many different occasions, but I think that most of them are given for recovery purposes. I myself was given one when I was in the hospital, and then later in a rehabilitation unit recovering from bilateral knee surgery. I kept it in my lap as I wheeled around in my wheel chair, and also put it over my lap in my bed. 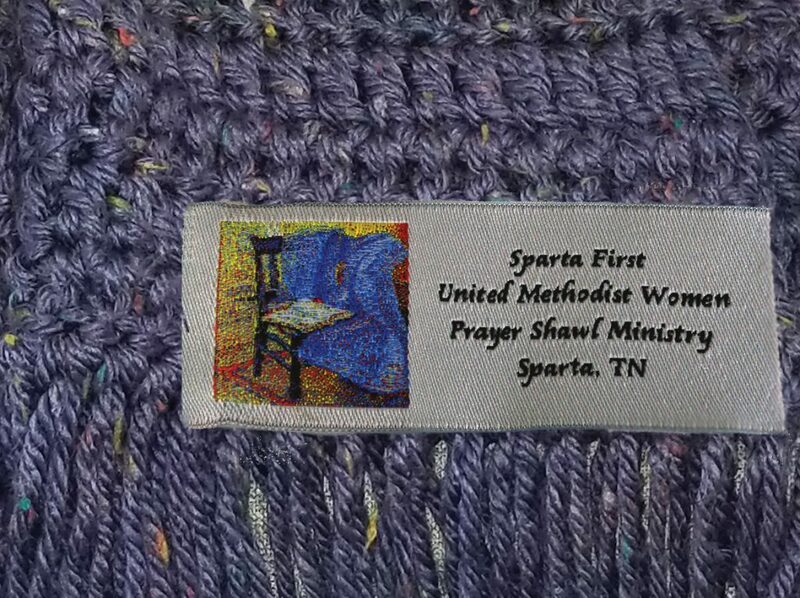 It was very comforting to know that my group of ladies had prayed over the lap blanket that I would have peace, and heal from my surgery without a hitch! I would show people the label on the corner of it, and tell them the story about this part of our ministry. We also have a ministry in our local hospital where we take small crocheted squares or rounds that our gals have made. We put these into a sandwich bag, and include a Prayer of Protection, along with our group name, church name, and address. These have been very popular, and we have had them be taken out of the totes we have in the waiting rooms at the hospital by many, many folks. The hospital Chaplin, wrote us a note once telling us that he really likes our ministry, and that he himself takes them to folks recovering in their rooms. I have also had handwritten notes left in the totes thanking us for these items, and the accompanying prayer. They are too small to put a label on, but we use the same picture as on the label on the printed paper insert. I was at the hospital filling the totes up again, and someone in the waiting room asked what they were. They asked if I had some snacks. I said that it was not food for the body, but that they were food for the heart & soul! Yes, these little squares and rounds are meant to be a soft item that someone in need can comfortably hold in their hand, and hopefully feel support and love as they read the prayer with it! May the peace of Christ be with you, now and forever more! Car collectors worldwide dream of competing at the Pebble Beach Concours d’Elegance. The home of the famed 18th fairway of Pebble Beach Golf Links, this is the ONLY time when motor vehicles are allowed on the golf course! Imagine that for a moment – the Pacific Ocean rolling in the background creating the stage of the most elegant car show in the world. We are so excited to have been commissioned to make the official judges hats for the 2nd year! 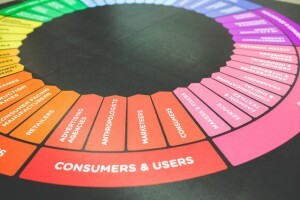 When you see one, let us know what you think. We love feedback and are looking for clues for next years hats! Do visit Khaki’s either online or onsite to see the most creative and amazing fashion displays in the country. We will post the pictures of the hats after they have been revealed at Pebble Beach. To learn more about our exclusive luxury corporate branding products where using the highest standards in promoting your branding is our top priority. Top hat and meticulous design – Sound familiar? Since 1950, Pebble Beach has been host to the finest exhibition of show cars in the world. The number one event of its type in the world. The Pebble Beach event strives to honor the artistry and craftsmanship of bygone eras. The Pebble Beach Concours d’Elegance is the world’s best annual display of historic and beautiful cars.